There's something for everyone here at First! From music to education, sewing, quilting, crafting, building...we have a place for you! Join us on Wednesday evenings for supper, worship, and learning! Wednesday L.I.F.T. (Living In Faith Together) is a time to pause in the midst of busy weeks and gather with family and friends to dig into our lives of faith. Come give it a try! Martin Luther wrote extensively about the importance of good, theologically sound education, both in the church and at home. Here at First Lutheran we have a number of educational opportunities for people of all ages! Whether you're looking for Children's Education or a Bible Study, Confirmation, Youth Group or Adult Education - we've got something for you! Check out our events page to see our calendar and a list of current bible studies, and jump in to join us anytime! Gods Work. Our Hands. It's a central message of the ELCA and we at First Lutheran take it to heart! We are blessed to be a blessing and have a number of projects going at any given time. 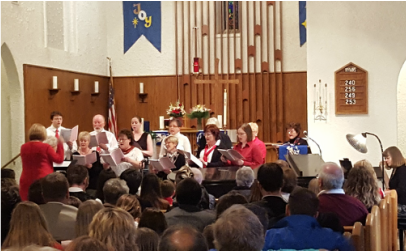 In grand Lutheran tradition, we are a congregation that loves music! Worship is led on both piano and organ (with a little guitar when the pastor is feeling brave). Our music program includes both a choir and bell choir, which anyone is welcome to join - no prior experience or professional skills necessary! We would love to have you join one of our ensembles! All are welcome - come make a joyful noise as we learn together!